As the Crimson piled on 37 shots through 60 minutes, Quinnipiac goaltender Keith Petruzzelli —who is unbeaten through five games — kept his cool. 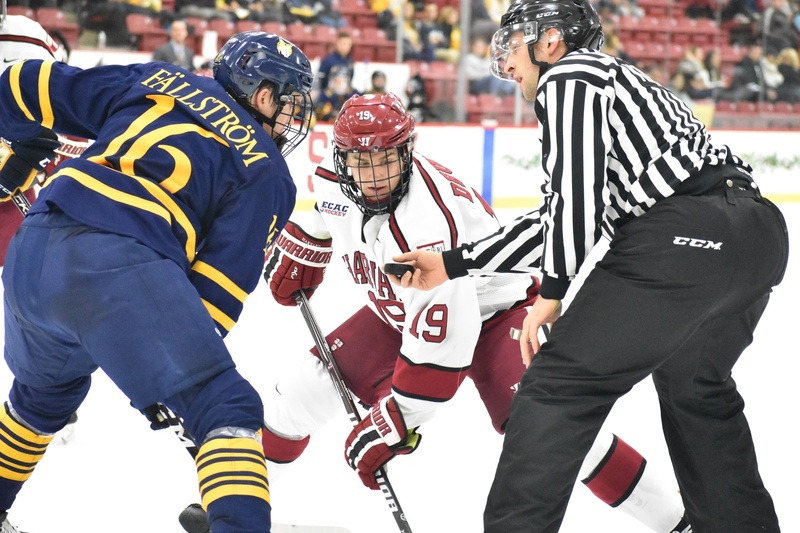 Last weekend, the question after the Harvard men’s hockey team’s season-opening overtime loss was whether the Crimson would be able to maintain a high enough compete level through three periods to keep the game in its control. In many ways, though, the nature of Friday’s home opener against No. 15/12 Quinnipiac, if not the result, was decided in its early minutes. That, in essence, summed up Harvard’s failed comeback effort, as the hosts (0-2-0, 0-2-0 ECAC) fell to the Bobcats (6-0-0, 1-0-0) by a score of 5-3. A pinballing puck squeaked past junior net-minder Cam Gornet, putting the visitors up less than three minutes into the contest. Quinnipiac began full-throttle and looked the part of the confident team a ways into its season against the relatively untested Crimson squad — a fact that probably did not help Gornet, who was making his first career start at home, and his first start since the Beanpot consolation game on Feb. 12. 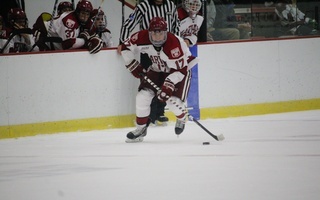 Immediately after conceding the goal, Harvard was prevented from gaining momentum as senior defenseman Adam Baughman headed to the penalty box. 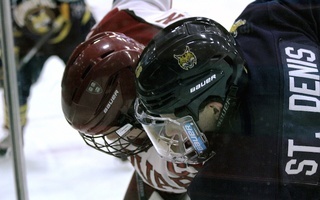 Later in the first period, as the hosts seemed to have found their footing, the Bobcats struck again on a Crimson slip-up. Sophomore forward Odeen Tufto made his way to the slot unguarded, and was in just the right place to one-time home a pass from the behind the net. The visitors left the ice jubilant after 20 minutes, leading 2-0. Shuffling of the lines after last weekend's loss against Dartmouth saw rookie Jack Drury centering the team's top line, alongside freshman Casey Dornbach and sophomore Henry Bowlby. As a second blow, Harvard started the middle frame on the penalty kill again. This time Quinnipiac capitalized just 55 seconds after the puck had dropped with a seeing-eye shot from senior defenseman Brandon Fortunato. Only a minute later, another Crimson skater was whistled for a minor — but to the relief of Harvard fans in the rink, the Bobcats committed a penalty of their own. 4-on-4 play opened the ice up well for these fast-skating teams, but Quinnipiac was not done yet. Another tally followed; the Crimson had now fallen behind 4-0. 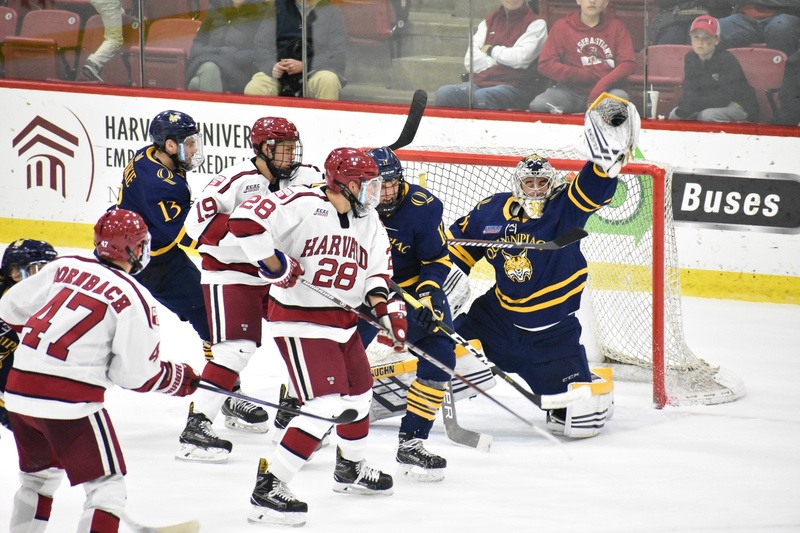 Score effects notwithstanding, though, Harvard was racking up shots, searching for the cracks in Bobcats sophomore goaltender Keith Petruzzelli’s steadiness. A mere half minute later, rookie defenseman Jack Rathbone found that crack with a snapshot near the top of the right circle, and nabbed his first collegiate goal. That first goal energized the Crimson once more. A flashy display of stick-handling from junior blueliner Adam Fox put Zerter-Gossage on the receiving end of a chance in front of Petruzzelli; with a cool head fake, the senior forward tucked it into the net. Harvard had notched two goals in less than a minute, and looked as if it could ride that momentum even further. Lewis Zerter-Gossage notched his first goal of the season on a slick Adam Fox feed. Not to be outdone, his fellow captain Michael Floodstrand scored his season first in the next period. There was to be no comeback that night. Yet another goal from the visitors ended the second period; the Crimson spent the third period with long shifts in the offensive zone, but could not finish on its chances. Though co-captain Michael Floodstrand did add a goal early in the third, it proved to be too little, too late. The Bobcats were strong contenders coming into this matchup, but the chippy, back-and-forth nature of the game meant a few strong shifts could have turned the tide either way. In fact, it was the visitors’ quick strikes on Harvard lapses that put the game away. Most importantly, though, Quinnipiac’s star players, from Tufto to captain Chase Priskie, made the most of their chances. Junior net-minder Cam Gornet steadied as the night went on, but his early mistakes cost him. In two game starts, this contest is his first loss. 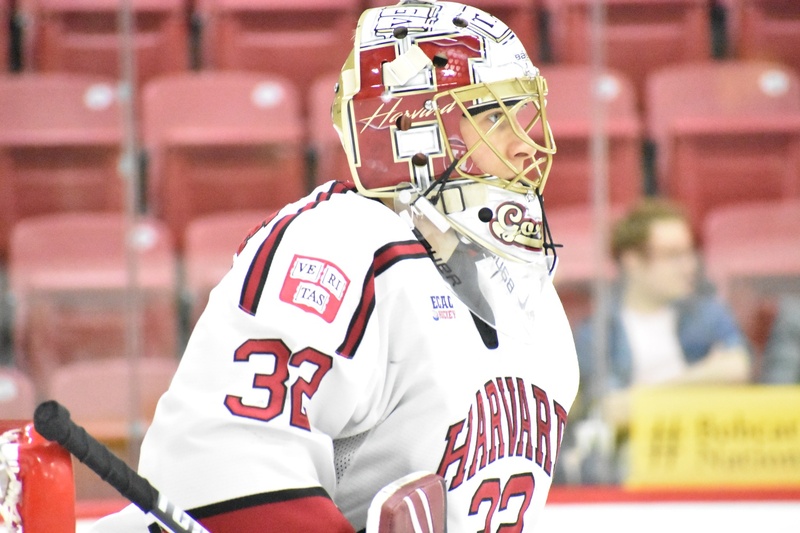 With Gornet (.833 SV%) starting this game, the Crimson faces a continuation of its goalie debate from last season. The junior certainly made some dramatic saves, going cross-crease to rob rookie forward Ethan de Jong and silencing the already-cheering Bobcats fans. But Harvard is staring at an ugly 5.99 goals against average, which might warrant increased focus on overall team defense. 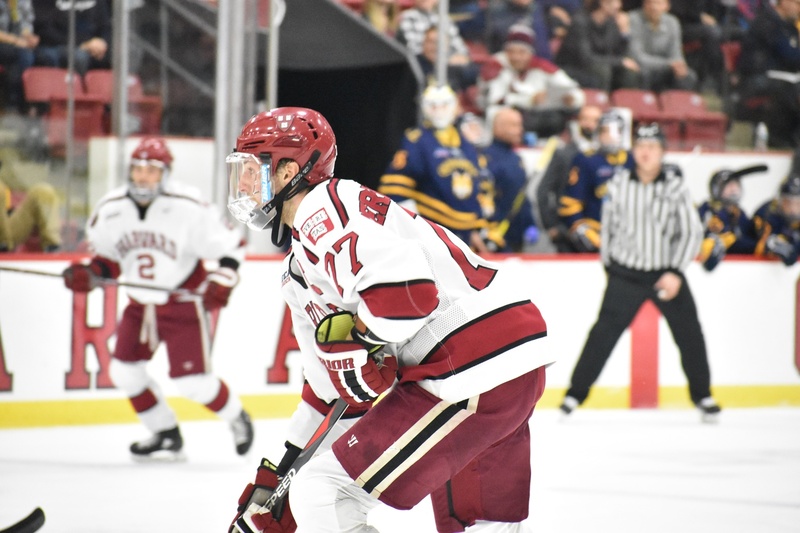 The turnaround time to answer these questions is not long; on Saturday, the Crimson plays host to Princeton, which is fresh off a triumphant 7-1 win at Dartmouth and returns much of its high-power scoring. 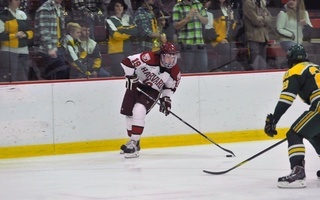 Harvard and Quinnipiac will square off for the ECAC championship tonight in Lake Placid.